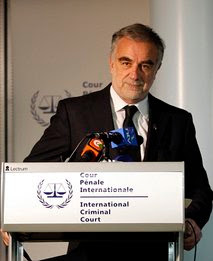 This afternoon, the prosecutor of the International Criminal Court (ICC) in the Hague announced that his office has applied for 3 international criminal arrest warrants linked to the brutal crackdown on pro-democracy demonstrators in Libya. This announcement comes less than 3 months after the United Nations Security Council unanimously referred the situation in Libya to the ICC. It's worth mentioning that Saif al-Islam is the second eldest son of Libyan Leader Muammar Gaddafi and, according to Moreno-Acampo, Saif is the "de facto Prime Minister" of Libya. Abdullah a-Sanussi is Gaddafi's brother-in-law, "executioner and the head of military intelligence." In a press conference which I watched live on France24 this afternoon, the prosecutor announced that direct evidence gathered during investigations by his office shows that Gaddafi personally ordered attacks on unarmed civilians and demonstrators in their homes and in public spaces using live ammunition, heavy weaponry and snipers. According to the prosecutor, "the crimes are crimes against humanity" and persecution of civilians "is still ongoing." Judges of the Pre-Trial Chamber are now expected to examine the prosecutor's application for arrest warrants and decide whether there's enough evidence to issue the warrants. There's an urgent need to protect civilians in Libya from "wide spread and systematic attacks" by government forces. It's no secret that thousands of civilians, including journalists and pro-democracy demonstrators have been killed and persecuted in Libya since February 2011. Arrest warrants for perpetrators of such deadly attacks against demonstrators in Libya would send a loud message to repressive regimes that the world is watching and that crimes which contravene international law would not go unpunished.